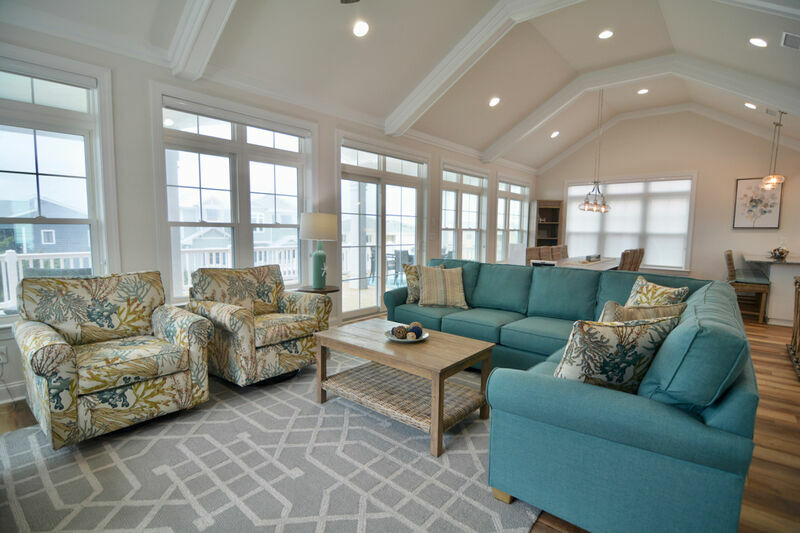 This new construction home is located near Ocean Isle’s town center with convenience to island stores, restaurants and with direct, handicap beach access across the street! This second row home is positioned to capture ocean views from the second floor living and kitchen areas and top sundeck. 5 Bedrooms and 5 Baths make up the home and it is furnished with the following bedding, sleeping 19: King, King, Queen/Double, Double/Twin, 2 bunk beds, and 2 sleeper sofas (one in living room and one in sitting area on first floor). Well-appointed home with lots of amenities: elevator to all floors, large, open concept living, kitchen and dining area (with dining for 12-14 and bar stools around the kitchen island), the first floor provides a second sitting space so your guests can spread out and relax, TVs in all bedrooms, DVD/Blu-ray players, gaming console, iPod docking station, Wireless Internet access. Outside you will be able to capture the ocean breeze from the covered deck, sundeck and pool area. Dining table al-fresco with comfortable porch furniture, gas grill and enclosed outdoor hot/cold shower. By the private pool there will be pool loungers, outdoor bar and picnic table. The pool can be heated (October-May) for $150 per day. Beach cart for convenience of hauling your beach gear to and from the beach each day. This home is non-smoking. No pets allowed. Home will be ready for rentals beginning June 1, 2019..